Fidget toys are increasingly popular for providing a temporary distraction from anxiety and stress. Amongst various fidget toys, fidget spinner has turned into a phenomenon on its own. Physics-defying tricks aside, there are many who claims that fidget spinners help to distract their mind from their worries. Other variants of fidget toys like stress ball also made its way to workplaces where employees struggled with daily stressors. Some of the fidget toys are definitely a cute sight to behold, while others made an elegant addition to office decor. But does any of these fidget toys actually help with anxiety and stress management? Can Fidget Toys Help Your Anxiety? People under extreme stress and anxiety often show symptoms of hypersensitivity. When you’re anxious, you may resort to pencil tapping, finger clicking or other forms of fidgeting. This is how your subconscious reacts to prevent your mind from being overwhelmed by all the triggers. This is when a fidget toy comes in handy. It allows you a channel to draw your focus and temporarily shield your mind from all the stress triggers. The rhythmic rotation of the fidget spinner can actually help you to calm your nerves in anxious situations. The claims that fidget toys offer temporary relief for anxiety is backed by scientific studies. A study conducted by researchers at the University of Surrey shows that patients using stress balls feels more relaxed during surgery and experience lesser pain. Stress balls have also been used in another clinical study on the effects of stress relief techniques on cancer patients. Patients are instructed to squeeze on the stress balls and take four slow breaths simultaneously. 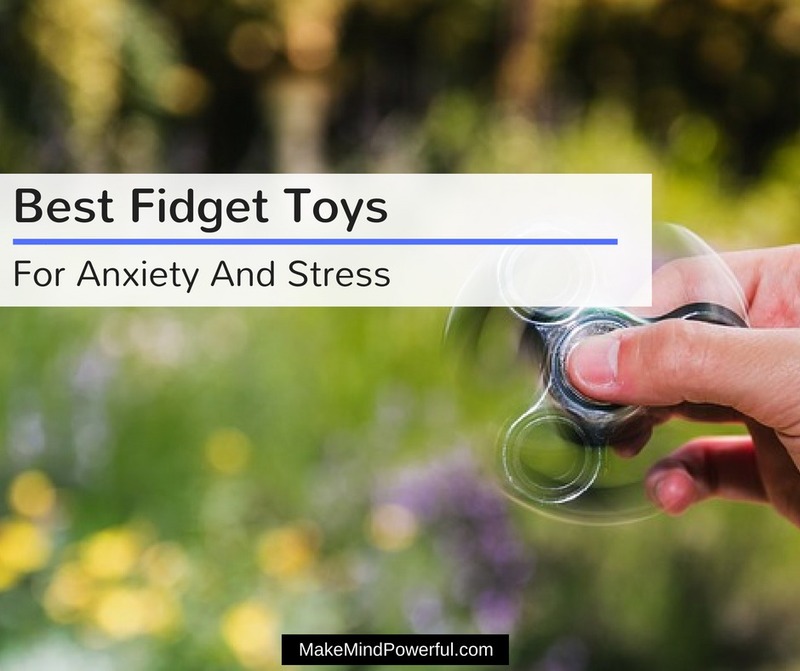 While studies on the positive effect of fidget toys on anxiety remain inconclusive, there are encouraging responses from people who are actually struggling with anxiety. After trying out a fidget spinner, my personal opinion is that it does provide temporary relief for anxiety but does not substitute any therapies or medication prescribed. There are literally hundreds or thousands of different sizes, shapes, and colors when it comes to fidget toys. It seems that choosing the right fidget toy can be such an impossible decision. Regardless of the various choices, these are factors worth considering when you’re deciding to get a fidget toy. Movement Type – Does it allow you to spin endlessly, squeeze, flick or pull? Some movement types may appeal to you more than others. Material – Chances are, you’ll be using the fidget toy for a while. It pays to select durable material that does not wear off with frequent use. You’ll also want to decide based on how the fidget toy will fell in your grasp. Are you comfortable with solid, soft, or squeezy texture? Extra Sensory Features – Some fidget toys have glowing LED or can be used along with essential oil for additional effect. Cost – Getting the lowest priced fidget toy is usually an unwise decision. There may be quality issues where the fidget toys would break after a few instances of use. Design – Not all fidget toys are created equal. Some boast elegant designs that made you want to display proudly on your desktop. Where To Buy Fidget Toys? You can usually buy fidget toys from toys shop. Of course, the options may be limited to only the popular types like fidget spinners. If you’re hoping to browse from a wider option, Amazon would be a decent place to shop. Not only you’ll be spoilt for choices, you’ll get the fidget toys delivered to your home in an easy checkout process. You’ll also get hassle-free returns should there be any issues in with the delivered fidget toys. Browsing for the best fidget toys can be a rather time-consuming process. You’ll have to go through the various features and reviews of other customers experience. Therefore, I’ve done the hard work and compiled a list of the most recommended fidget toys for you. 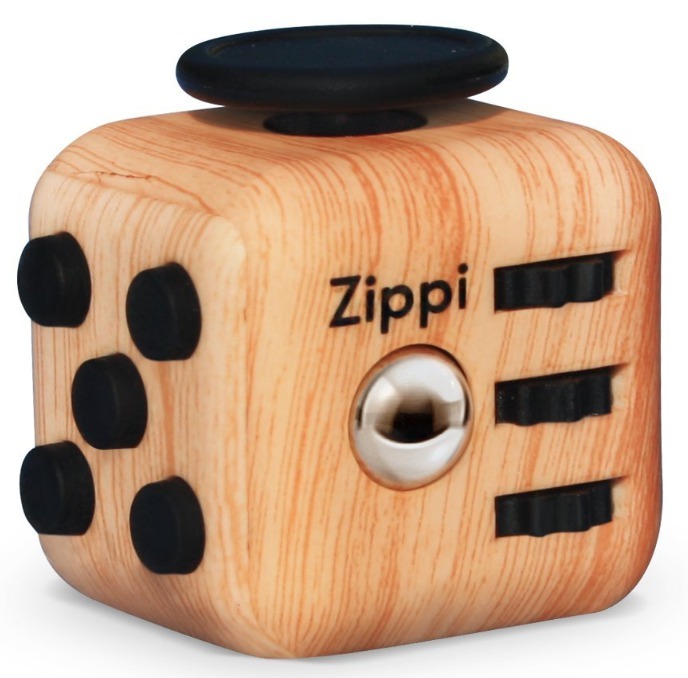 You’ll have various sensations to distract you from anxiety with this fidget cube by Zippi. The six-sided cube will allow you to rub, glide, roll, flip, click and spin on each of its individual sides. You can expect the cube to be durable as it’s made of high-quality ABS plastic and silicone. The cube has a soft rubber sensation that helps you to focus in stressful situations. Children will also benefit from playing with the fidget cube as it helps them to pay more attention in school. Not only it is made of premium materials, the cube itself is small enough to fit in your pocket to be used anywhere. If you’re showing symptoms of anxiety by constantly flicking pen or biting nails at work, this fidget cube will be a great addition to your workplace. It helps you to be more productive as keep your mind free from the stress elements at work. It is silent enough to not distract your colleagues at work. Enable kids to stay focused. 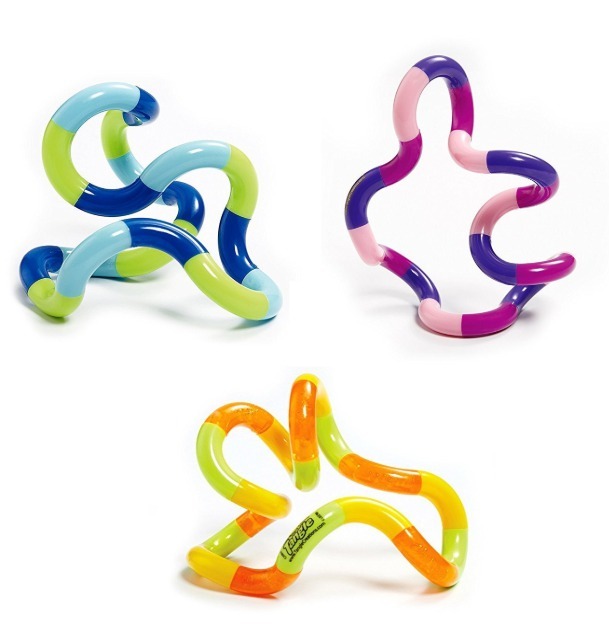 This set of five sensory string allows you to stretch, twirl, pull, squeeze or wrap your way out of stress. They are made of premium BPA-free materials that are hypoallergenic and non-toxic. Kids can play with these fidget strings safely without risking their health. Each of the strings is different in colors and measures 12 inches long. However, they are highly elastic and allow you to stretch the fidget strings up to 8 feet without breaking. Do not worry about them getting out of form as the strings will return to their original shapes when released. They made a great addition to both home and offices. It helps you to calm down when you’re in a highly anxious situation. Pulling the strings draw your thoughts to the activity at hand instead of allowing them to run wild. You can use them with other fidget toys in your collections. Highly elastic, stretch up to 8 feet. May not be suitable for kids as they can hurt themselves from the recoil. Fidget toys can hone your creativity besides helping you to release pent-up stress. This is proved by the fidget toys by tangle. It’s made of interconnected curves that allow you to attach or rotate at each joint. They are available in different colors that can be mixed together. There are various possibilities of using Tangle. You can turn it into a sculpture, a puzzle, brain training device or an effective stress releasing tool. The Tangles allow you to be creative while absorbed in a calming process. Both adults and children will find playing with Tangle enjoyable. They are small enough to bring on family trips and help children to stay focused on a long journey. Besides that, you can also use Tangle to distract your kids from the influence of smartphones or tablet. They are definitely useful fidget toys to when you’re getting anxious. Helps to calm down anxiety. Fun to play for both adults and kids. This flippy chain lets you keep your fingers busy as you try to keep anxious thoughts away. You’ll never get fidget toys as sturdy as these. The flippy chain is made from bike chain that has been cleaned to give it a sparkling look. It is stainless steel and will never corrode or break, as with other plastic materials. No one will be distracted when you’re flipping the chain. It was designed to be quiet when the mechanism moves. This made it handy to use in meetings, offices, and classrooms as it doesn’t distract others nearby. You may find yourself more productive as your mind is focused on what really matters. 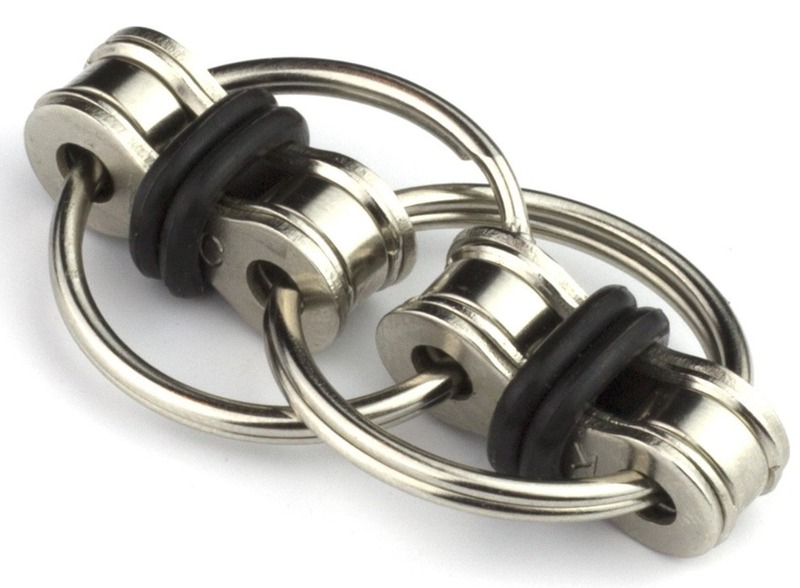 Handcrafted in the USA, this chain is one of the more effective fidget toys that will relieve you from anxiety habits like nail-biting and finger tapping. People with social anxiety may find it useful to carry along to gatherings where anxiety is usually hitting the roof. Great for calming down nerves. Helps your mind stay focused. 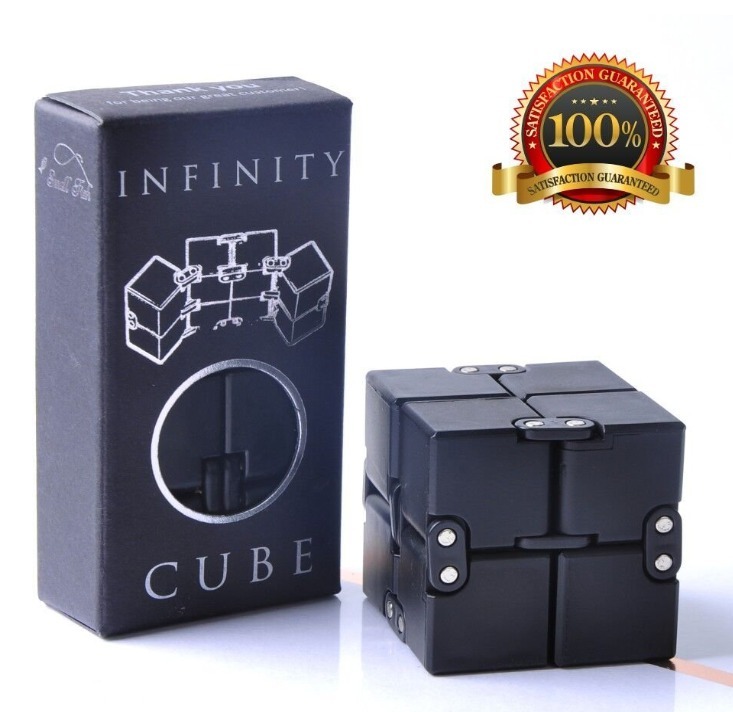 If you’re looking for a truly unique fidget toy, this infinity cube from JoeYank definitely made the list. It is a combination of 8 small cubes that are brought together by the underlying structure. These cubes can rotate in any directions and allows you to form any structure by nudging the cubes in your hand. The infinity cube is no cheap fidget toy, at least where the material is concerned. It is made of high-quality anodized aluminum and manufactured with CNC machine. It’s highly effective in calming anxiety and the resulting physical manifestations like nail biting and leg shaking. 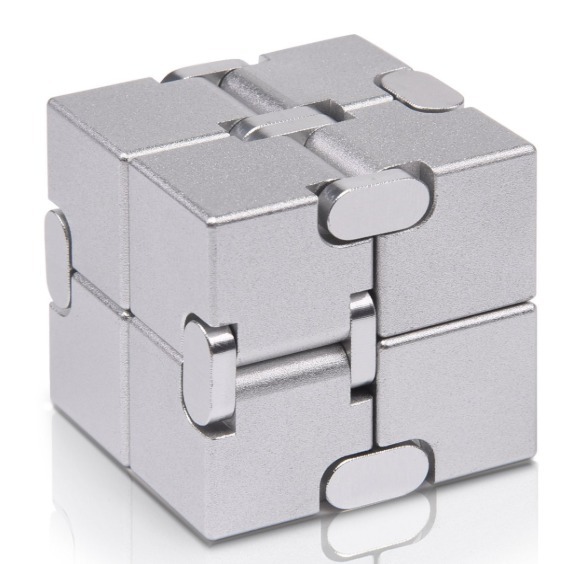 You’ll also find that the infinity cube is perfect as a gift for your loved ones who tend to get anxious. It is shipped with a decent looking pouch. The cube is small enough to fit into the pocket on your jean and that made it convenient to carry around. Smaller cubes can be rotated freely. Help reduce nail biting and other anxious habits. 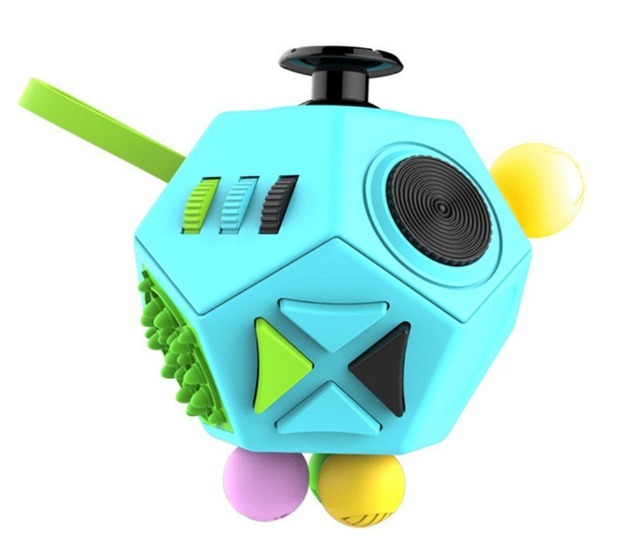 If you’re not content with a 6 sided fidget cube, try this 12-sided version from Minilopa. Each side feature different sensory elements that include buttons, switch, stress balls, joystick and gears to keep your fingers busy. They are a great tool to soothe any negative emotions. The button on the fidget cube mimics those on a game controller. You’ll be able to pull and pinched it to your content. The finger massage surface not only helps to release your stress but also improves blood circulation. You can practically carry and use this fidget cube anywhere as it fits right into your hand and does not squeak when you’re fidgeting with it. If you’re getting particularly anxious about an upcoming interview, you may want to hide one into your pocket while heading to the venue. Compact size made it ideal for travel. Fidget toy does not have to look cheap all the time. Small Fish definitely has the luxury in mind when this infinity cube was designed. Beneath the premium appearance is 8 small cubes made of rugged ABS plastic. 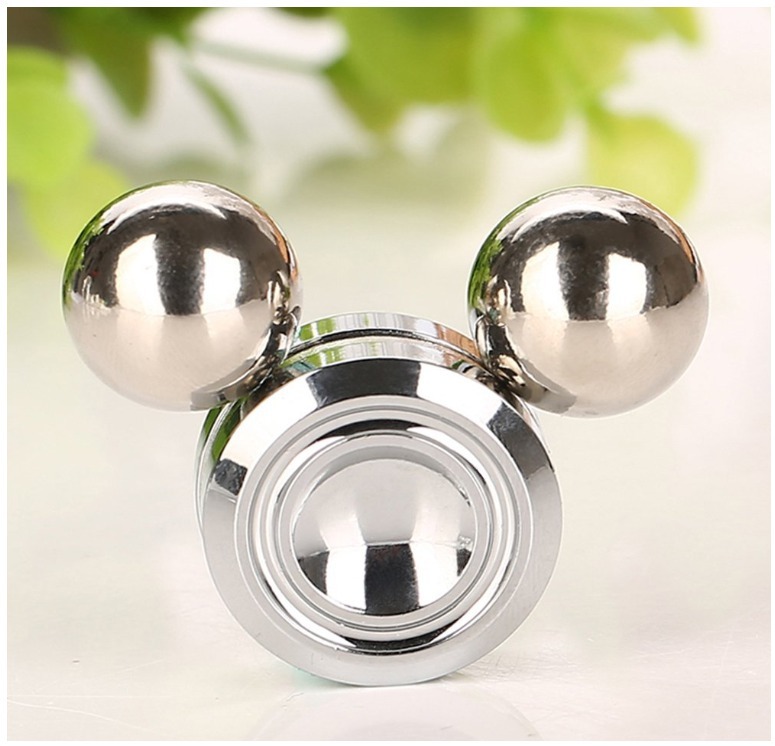 They are brought together by heavy duty stainless steel bearings. The manufacturer has gone to great length to ensure the fidget cube is safe by ensuring it has complied with the ASTM International Toy Safety standard. This made it safe to be used by children above 3 years old. Besides the fun factor, the fidget cube is effective in reducing anxiety. You’ll find that the cube is strangely addictive as it keeps your hand busy for hours in either class or office. The elegant design and premium packaging also made it a perfect gift for your family and friends. It is compact and noiseless as you flip it around. Some customers received defective units. This is arguably one of the most unique fidget toys you’ll come across on the internet. Also named as the Orbiter, it consists of a hand spinner, a frictionless trackball, and a spinning top. It is extremely easy to use and you’ll get the hang of the Orbiter in no time. The orbit ball toy can easily fit into your pocket. That allows you to grab them out and start fidgeting whenever you’re anxious. The flexibility of the mechanism allows you to explore creatively on the different ways the magnetic balls can be moved. For a start, you can move the ball along the magnetic strip to create a spinning motion. You can also play a balancing game with the magnetic ball. 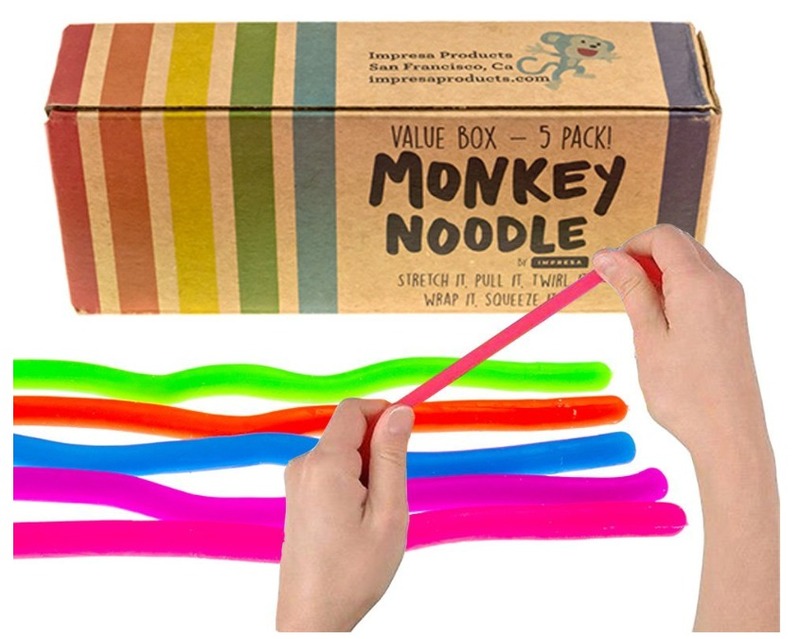 The dynamics that this simple toy ensures that you have more fun relieving stress than mere flicking a pen around. Helps calm anxiety in a fun way. If there’s any fidget spinner that deserves a mention, it’s this high-speed fidget spinner by VintgaGood. For a start, it deviates from the typical fidget spinner design. 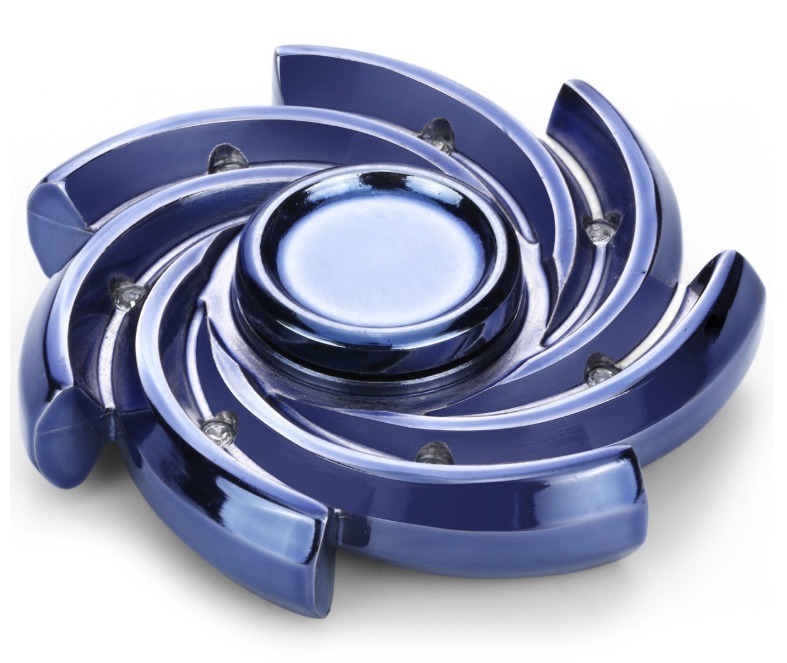 The spinner is made of high-quality zinc alloy making it lightweight and yet sturdy. The bones bearings enable it to achieve consistent high-speed spin that lasts up to 9 minutes. It’s definitely a great choice of fidget toys when spinning helps you to calm down. You can carry it easily as it is nothing larger than pocket size. Getting the spinner to spin is pretty easy. The common method is to hold the spinner between your thumb and middle finger while using the index finger to flick it. There are also other ways you can try spinning the spinner and they all keep your mind occupied with anxious thoughts. Compact pocket size fidget toy. Some spinners broke off easily. This fidget toy is probably something new to you. Its construction is based on Chaos Theory of a double pendulum and random motion where the motions are unpredictable for every spin. There are various ways to fidget where you can flick, spin or simply drop it to create random movements. 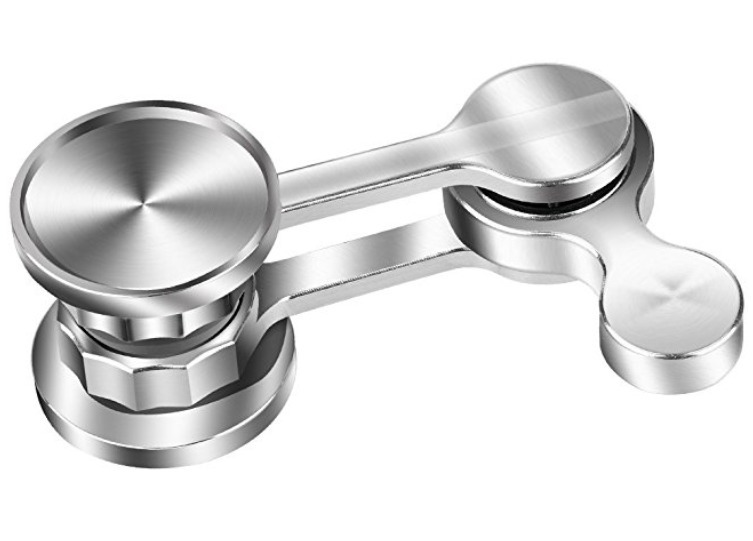 The spinner is made of sturdy stainless steel and machined grips and arms. The bearings used in the construction are highly precise and this enables to achieve friction free movements. You’ll find that using this fidget toy will help you release anxiety and stress. It is also shipped with a nice looking gift box. As this is not your typical fidget toy, you’ll also find a user manual to guide you along. Whether you’re looking for a fidget spinner to reduce anxiety or simply a fan of fidget toys, this spinner screams originality. Defective products in some cases. Fidget toys are definitely fun to play with. Even if it’s not used for anxiety, both adults and kids may find the spinning, flipping or squeezing addicting. However, before you start unwrapping a fidget toy, there are a few things to bear in mind. Always ensure that the age recommendations are stated clearly on the manufacturer label. As a rule, never allow toddler below 3 years of age to play any fidget toys. For those who are within the age range, make sure that they are old enough to understand the rules of using fidget spinner safely. Some fidget toys have bearings as part of the mechanism. Bearings may get damaged when shipped or worn off during the course of usage. Do not use fidget toys with defective bearings as they may pop off and cause safety risks. Most fidget toys are labeled correctly to reflect the age range. However, some fidget toys may contain coin cell batteries for the built-in LED feature. You’ll need to ensure that the compartment to the batteries cannot be easily opened as the batteries may be a choking hazard. Also, do have realistic expectations when using fidget toys to reduce anxiety. They may work as a great distraction temporarily, but that doesn’t substitute any therapies or medication that you’re prescribed to. Which fidget toys grabbed your attention? Share the best fidget toys that you’ve found effective for stress relief in the comment below. Previous Post Best Passion Flower Supplement 2019 (Review & Guide) Next Post Can Caffeine Heighten Your Anxiety?